What does it mean for a device to be “configured to” perform a particular function? In Superior Industries, the patentee had claimed a dump truck with a “support frame . . . configured to support an end of an earthen ramp.” On remand, the district court will need to determine again whether that language should be interpreted as a positive claim limitation. One problem with Judge Rader’s opinion is that other judges do not uniformly agree with his perspective. The diversity of court opinion compounds an already difficult process of understanding what potential structures are covered by function-focused claim terms. A third compounding difficulty is the rapid rise in the use of functional claim terms. The Patent Act expressly provides for the use of functional claim language — written in means-plus-function format. 35 U.S.C. §112(f). The statutory requirements of §112(f) began being more strictly enforced in the mid-1990s and, as a consequence, means-plus-function limitations have fallen from favor. Meanwhile, patentees have caught-on to using “configured to” language as a rough equivalent of a means-plus-function claim term but carefully drafted in order to avoid actually falling under the ambit of that provision. The benefit then for patentees is that the functional language is broad and not limited to particular structural embodiments. 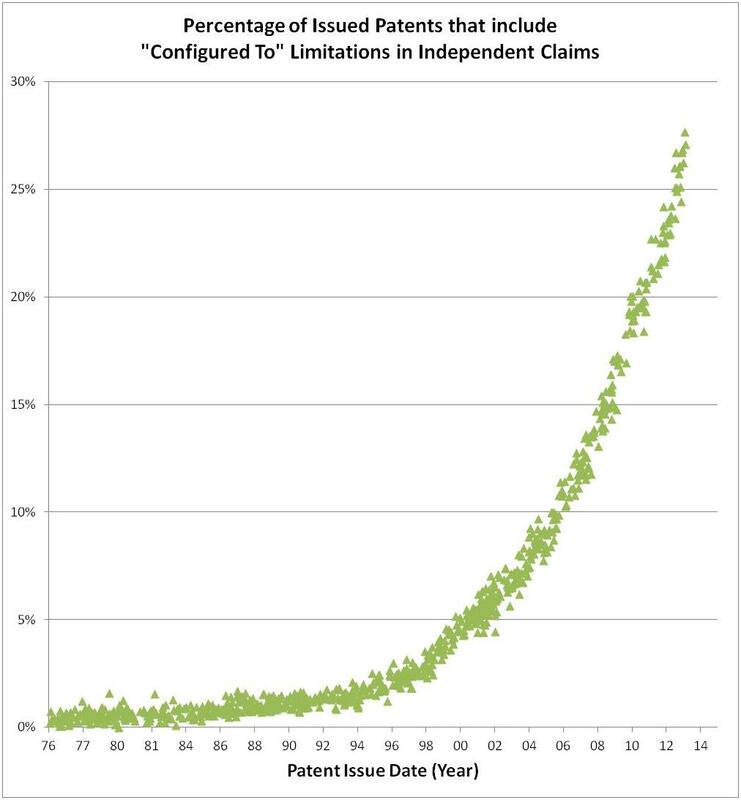 The chart below shows the percentage of issued patents that include at least one “configured to” claim limitation within an independent claim. This dramatic transformation of claiming strategy raises the importance of cases such as Nautilus v. Biosig Instruments (pending Supreme Court case on the proper standard for indefiniteness) and Lighting Ballast (pending en banc decision on claim construction deference with a focus on functional claim terms should be interpreted as falling within 112(f)). This general prohibition against the use of “purely functional claim language” (and the more specific Halliburton rule) has not been completely eliminated. Rather, “purely functional claim language” is now permissible but only under the conditions of 35 U.S.C. § 112, sixth paragraph, i.e., if its scope is limited to the corresponding structure, material, or act disclosed in the specification and equivalents thereof. In Miyazaki, the problematic claim language was “a sheet feeding area operable to feed at least one roll of paper, at least one sheet of paper and at least one stiff carton toward a printing unit.” In Halliburton, the problematic claim language was “a tuned acoustical means which performs the functions of a sound filter.” In each case, the claims were found indefinite. Ultimately, are not many structural nouns inherently functional? Take the term “handle,” please. In the dump truck arts, a dump truck having a component for which the name “support frame” is apt cannot conceibably be novel. Nor can it be novel that this component we call a Support Frame is capable of performing a support function. If it supports things, then it can Support, amongst other things, an end of an “earthen bank”. Where’s the novelty? Of course “configured to” language can be limiting. For example, a conveyor belt, configured to convey a moving bed of cigarettes at a rate of at least 1000 cigarettes per foot per second, would need to be big enough and fast enough to achieve that result. The functional language would exclude, for example, a conveyor intended to advance cars along an assembly line, configured to perform that task but also a Cigarette Conveyor “for” conveying cigarettes in the sense that it is capable of and “configured to” advance not only cars but also cigarettes along the line, yes? The functional language would exclude, for example, a conveyor intended to advance cars along an assembly line, configured to perform that task but also a Cigarette Conveyor “for” conveying cigarettes in the sense that it is capable of and “configured to” advance not only cars but also cigarettes along the line, yes? I don’t know, would it? Supposing you have a conveyor intended to advance cars, but if you put enough cigarettes on it instead, without further modification, it would advance them at the claimed rate. Nobody has ever done that before, because only auto makers have purchased that conveyor so far. Is it then a conveyor “configured to” convey cigarettes at the claimed rate? Is it a conveyor “for” or “capable of” conveying cigarettes at the claimed rate? And how is the examiner expected to search for relevant prior art? Yes. In the situation you posit, the claim was formulated too broadly. “Configured to,” when used properly, doesn’t indicate an intended use, but instead imparts physical limitations on the referenced element. The facts you put forward are the same as in re Schreiber, the oil can funnel case. Is it a conveyor “for” or “capable of” conveying cigarettes at the claimed rate? Of course they do. That’s why I was asking. The problem is that none of those phrases mean very much, which is why you rightly consider the claim to be too broad. That’s pretty much why examiners will ignore them (broadest reasonable interpretation is usually that they mean nothing at all), and courts will have to entertain a debate as to how they limit the claim. The question is really how “too broad” these claims are, and if they reasonably admit of construction. How much modification would a device need before it stopped being “configured to” do X as it stood, assuming that it was never contemplated for that purpose? What if the conveyor would have to run at 11, which it could sustain, but it only had speed settings up to 10? What if it needed little cigarette pushers on the belt, which were an inherent feature of all cigarette conveyors? What if the cigarettes had to be in a big box (that fit nicely on the car conveyor) to meet the claim, but the art normally conveyed them individually? What if the conveyor had software that needed to be reprogrammed in some way? And wouldn’t it be odd if a device was “configured to” do X, but simultaneously not “capable of” doing X? See the Nazomi case, IANAE. The rest of your post is mere dust-kicking, spasmodic convulsions of someone not willing to understand. Sure it would, but that doesn’t make those phrases synonymous. The question is really how “too broad” these claims are, and if they reasonably admit of construction. I haven’t looked at the dump truck claim, but I can certainly imagine lots of claims in which a phrase like “support frame . . . configured to support an end of an earthen ramp” can be very reasonably construed and can limit the claim in a meaningful. The support frame has to be physically strong enough to support an end of an earthen ramp (whatever an earthen ramp is), has to be shaped in such a way that an end of an earthen ramp can be supported by it, and it has to be positioned, relative to the rest of the claimed structure, in such a way that it can support an earthen ramp. In context, that may be a very broadly recited limitation or it may not, but it’s still limiting (and it’s probably definite if the claim is drafted reasonably well). In any case, a structure that is made of paper likely won’t fall under the limitation, nor will a prior art structure that’s fixed and hidden under the passenger seat of an automobile. Sorry IANAE, LB, my bad. I had in mind that the cigarette conveyor advances at a speed that the auto conveyor just can’t match. I was thinking of 60 ft per minute but, in my haste, failed to define it unambiguously. I wanted to reveal to readers that functional language in a claim CAN be limiting, but NOT by reciting in the Claim something indefinite, and extrinsic to the machine, like “earth” or “auto”. I agree. That’s why it’s so silly to claim a storage medium in terms of what it makes an unspecified computer do. But even when functional language refers to an intrinsic function of the machine, it may still raise serious issues of definiteness, construction, and validity. Particularly when the function is recited in terms that are not common in the relevant art (e.g. what a car conveyor would do with cigarettes), or when minimal additional “configuration” is required, such as overclocking the belt, reprogramming the controller, or even simply telling the machine to do what the claim says. Thanks IANAE. That point about the storage medium is interesting. But note that I did not say that “cigarette” was indefinite. There is not much scope to vary the size and shape of a cigarette, is there. Like claiming a glove by reference to the features of the human hand? Perhaps then, one can claim a computer program on a carrier without getting indefinite. Don’t know: not my special field. That’s why it’s so silly to claim a storage medium in terms of what it makes an unspecified computer do. Functional language certainly may raise issues of definiteness, construction, and validity. However, I don’t see what a situation where “minimal additional ‘configuration'” is required has to do with any of those things. It may be highly relevant to obviousness. had in mind that the cigarette conveyor advances at a speed that the auto conveyor just can’t match. I understood what you meant. Incidentally, have you ever been to a modern cigarette factory? The technology is truly amazing. The conveyors I saw probably didn’t move loose cigarettes as quickly as 100 fpm, but they moved huge numbers of them very efficiently, without breaking any of them. I gave up smoking years ago, but the quality control in cigarette production is remarkable – defects in what is actually a very fragile product were nearly non-existent among the many thousands of cigarettes that I was foolish enough to smoke. Thanks LB. No, like nearly everybody, I have never seen this “truly amazing” technology that Philip Morris runs but I’m sure it is most uplifting to watch it working. American is it? Or Japanese? Or maybe Swiss? Where in the world are the inventors? Dude I went to Phillip Morris USA in Richmond to see about a job there, and that sh t be pim ped. And actually if I recall correctly the older machines they had at the time were German. Though I can’t recall where the new ones were from. Probably the same people though. In MaxDrei’s example of “configured to” convey a moving bed of cigarettes, the question is whether this language would “exclude” a conveyor that could also advance cars. Answer: Construction of functional language such as “configured to,” “capable of,” and “adapted to,” rarely or never asks what is excluded. Construction of these types of claim language only ask if the device in question is actually capable of performing that function. “Consisting of” may have exclusionary qualities, but “configured to” is not exclusionary. To avoid ambiguity, I prefer only to use “capable of” terminology in my functional elements. This is not legal advice. It is not even good advice. There is a very real difference between ‘capable of’ and ‘configured to’ and you seem blithely unaware of what the language you prefere to use actually means. This, however, is not what Schreiber stands for (nor is this quote found anywhere in Schreiber). Schreiber, to the contrary, states “A patent applicant is free to recite features of an apparatus either structurally or functionally.” at 1478. The case then delves into an inherency analysis, and discusses burdens of proof. After a brief review of caselaw, my take is that the Federal Circuit has interpreted the term “configured to” to mean “is inherently capable of without further modification.” See Id., Typhoon Touch Technologies v. Dell et al., 659 F.3d 1376 (Fed Cir., Nov. 2011), Microprocessor Enhancement Corp. v. Texas Instruments, Inc., 520 F.3d 1367 (Fed. Cir. 2008), K-2 Corp. v. Salomon S.A., 191 F.3d 1356, 1363 (Fed. Cir. 1999), In re Swinehart, 58 C.C.P.A. 1027, 439 F.2d 210, 212, 169 USPQ 226, 228 (CCPA 1971). O rly? What does it “stand for”? Yes, you can feel free to chock it full of functional language but ultimately you will only distinguish the claim from the prior art in terms of structure. We make no objection to you chocking your claim full of functional recitations. Nah Typhoon Touch and Mircoprocessor are just attempts to prop up their house of cards. Shortly the supreme court will step in and apply the law for them. Your belief system is like a set of blinders, with how you choose to see the world painted on the inner edge (just in case you try to peek). It is breathtaking to see how hard you will strive NOT to understand the real world about you. Not understand the world around me? I just demonstrated that I understood perfectly the world around me. There is a rule in place that has been in place for a century at least. It’s easy to understand the rule. Likewise, the CAFC has erected a house of cards, ripe for the supreme court to knock down for them. What’s unrealistic about that? They’ve done it like 5 verified times in the last decade. What’s one more on the pile? The only thing you have demonstrated is the ability to ignore reality when you are faced with your belief system. It appears that Judge Rader’s statement here is at odds with the Typhoon Touch Technologies opinion… an opinion that he signed on to. 659 F.3d 1376 (Fed. Cir. 2011). Nah man, it isn’t at odds at all. You have to understand, in Rader, and some other judge’s minds they’ve convinced themselves that in the softiewaftie arts function magically equals structure. This only happens in the softiewaftie arts though, not the dumptruck arts. This only happens in the softiewaftie arts though, not the dumptruck arts. Rader’s a smart man. He knows the difference between a truck and a series of tubes. Yes, the functional limitations limit what will infringe, they do not help you distinguish your apparatus. It’s a single-edged sword against you as a drafter. Remember, K-2 is the patentee doing the suing arguing for a construction that will lead to INFRINGEMENT. He is not an accused infringer arguing for a construction that will lead to the claim not distinguishing over the prior art. The functional language limits what he will be able to claim INFRINGES. It will not help him distinguish over the prior art. This is what confuses people about many cases re apparatus claims and functional language. Such functional language in an apparatus claim only hurts you in any art other than the softiewaftie arts where the federal circuit believes magic happens. Sorry that should read “distinguish your apparatus from the prior art” in the first paragraph. Check out your legal treatises on the matter LB. I agree that it is a bit “ridiculous”. I think such limitations should simply be banned in apparatus claims rather than allow that sort of a system to pervade. But there is a reason to let people include them even though they won’t help them distinguish. They can still help establish a backdrop in the claim for the part that will ultimately distinguish. And that backdrop can be phrased broadly rather than perhaps more narrowly than it would otherwise need to be in the absence of allowing functional limitations into the claim at all. And I can live with that. But, it is rather similar to the “product by process” situation. And I don’t hear you whining about that situation. Both situations involve, ultimately, process limitations in a device/product/apparatus claim since the functional limitations are nearly invariably going to be some process step. Much like 6’s one hand clapping. The call of the question mis-interprets Rader’s statement. Rader wrote “it is usually improper to construe NON-FUNCTIONAL CLAIM TERMS IN SYSTEM CLAIMS in a way that makes infringement or validity turn on their function. IE: His statement applies only to the terms in a claim drafted in a structural manner. However, we are concerned with FUNCTIONAL claim terms in system claims. There, the construction necessarily turns on the function. Consider “Selector” S3 Inc. v. nVIDIA Corp., 259 F.3d 1364 (Fed. Cir. 2001), “detector”, Personalized Media Communications v. ITC 161 F. 3d 696 (Fed. Cir. 1998); Lighting World (“connector assembly for connecting”). In re Fuetterer (CCPA 1963) is really the most cogent statement on this issue of result versus functional claiming. Then doesn’t it make sense to define the phrase? Something like “As used in the specification and the claims, the phrase “configured to” denotes an actual state of configuration that fundamentally ties recited elements to the physical characteristics of the recited structure”? While it does make sense to call for a definition of the term, “functional limitation,” please note that an understanding of claim construction analysis of functional limitations cannot be adequately disclosed in an internet chat room. This is like requesting a concise definition of “obviousness.” We know that “obviousness” is subject to about a dozen distinct doctrines, as set forth by the Federal Circuit and by the CCPA. Claim construction of functional limitations requires an understanding of several different lineages of cases from the Federal Circuit — and this is beyond the scope of a chat room. “chat room”?! Nay! This is a dynamically updating journal article! Will someone please post the Summary so I can get out of here? You are free to include “Blogger” on your resume, and in your list of posted bloggings, you can cite this particular chat. Claim construction of a functional term isn’t that complex brody. If it were then no examiner would ever comprehend a functional term in a patent before them. The array of issues relating to functional elements involves a complex array of issues, because it requires an understanding of about a dozen different doctrines, for example, the doctrine of inherency. Inherency is not trivial. Perhaps, in about a quarter of cases from the Board that deal with functional limitations, the Board’s analysis involves inherency. An odd grammar you used there. But that’s interesting. But then, the cases that reach the board are the tiny smidgen of cases that aren’t resolved before the examiner. Well I agree, if you’re going to consider things like inherency. But those are separate concepts that are concepts in and of themselves. And if you’re talking about things like inherency being included in the conversation then you may as well trumpet the complexity of claim construction as a whole. Besides, inherency issues are rather seldom are involved in functional language claim construction disputes and even when they are they are readily resolved. My comment clearly was about defining the phrase “configured to”. Therefore, I am going to just assume that you missed the boat (your answer doesn’t make sense in light of my first sentence). You ready to show that actual state in your drawings? Or did you really mean “all actual states” instead of “an actual state” where you’d really rather not show any of the “actual states”? Why couldn’t you show it in the drawings? If I say “a fastener configured to attach the first cloth panel to the second cloth panel” then I can show, for example, a zipper. That means that I have showed the fastener configured in the manner that I described. Where would the objection come from? Tom, Bully for the PTO. But the PTO is not the law. The Supreme Court is the law, followed by the Federal Circuit. Thank you for the advance warning Tom. But since you are so clearly wrong even in your short paragraph (“same thing” – really? ), you havesaved me the time from reading any of your fifty page article. Repeating your error makes it no less an error. You have to understand Tom, anon has a somewhat delusional view of functional “limitations” and “elements” and ascribes special significance to each term. Not really 6 – it is just that I attach the appropriate caution to the use of the terms. Sort of like Tom himself goes on to use with his further discussion with you and the fact that there are several different doctrines to be aware of – and the doctrines simply have different levels of application in any given situation. Delusional? Hardly – Quite the opposite, clearly. Regarding the use of the term “element” versus “limitation,” at my first law firm patenting position some 14 years ago, at Coudert Brothers, I asked one of the partners what (if anything) was the difference in meaning. The man did not have an answer. The following is my own answer to this question (this is not legal advice). The term “element” refers to any phrase that occurs in a claim, whether limiting or not. But the term “limitation” only refers to phrases in a claim that are not limiting. The case law on preambles provides abundant guidance on how to determine if a phrase in a claim (at least those phrases in the Preamble) are limiting or not. However, I would hesitate to state that, regarding phrases in the body of the claim, it makes much sense to distinguish between “element” and “limitation.” “Element” is probably broader, because it encompasses things that usually have no patentable weight, such as a recitation of data, “information,” or a list of numbers. The new software has a nesting limit…? Anywho, 6, pay attention to how Tom backtracks and rights himself by adding detail and a proper view because I was right to begin with. Tom, I may be enticed to read your article now that you are showing a better understanding of the situation. It’s a good thing that the Board gives patentable weight to “configured to” elements because examiners have been insisting on this language for a few years. It would be odd for the PTO to teach examiners to insist on the language and then have the Board ignore the language. Please let us know when the article is published. I’ve seen many recent office action with rejections ignoring claim limitations by labeling the limitations as “intended use” limitations. It largely depends on the language, but typically a claim including an “adapted to” limitation excludes products/items not “adapted to”. typically a claim including an “adapted to” limitation excludes products/items not “adapted to”. Yes, but that still doesn’t actually mean anything. How do you know whether a device that is capable of performing a particular function is “adapted to” perform that function? Does it have to be first manufactured and then modified in some way? Does it have to be designed with the specific intention of performing that function? Or is it simply a device that performs the function when interacted with in a particular way (i.e. merely “capable of”)? Maybe you should do more than just read cases, 6. Tom, you do know that In re Benson was the very case overruled by Gottschalk v. Benson? Lulz I thought it might be. Overruled on different grounds, that is, because of a different issue. This is not legal advice. If you are going to post here you should be aware that the riffraff love to kick dust. So what if it was overruled on different grounds? The decision that you’re citing is toast. Less than toast in fact. But the case was overruled by the Supreme Court. It makes no difference that CCPA cases are binding on the Federal Circuit. Board opinions are nice to know for getting allowances, but for validity analysis, the real action is obviously the Fed Cir. What’s most interesting to me, though, is that this is coming up in a mechanical case. MM? The rule of construction of functional claim elements directed to new structure historically was what we now find in 112(f). Somehow, the courts seem to think that the rule should ONLY be applied when the form of “means for” as per 112(f) applies. I note the trend in that direction by the courts — to apply 112(f) outside of the form of “means for.” That trend always was the law. But there is a caveat. If the element is old and well known, the scope should be to cover all such known structure without more. It is the jurisprudence governing 112(f) that does not recognize this distinction that is the problem. The major malefactor in this is Rader’s ruling in Valmont. What trend is that, Ned? Do you have any data to back up your notion that there is a “trend”? Do any of the underlying cases deal with “configured to” limitations (or “configured to” elements – same thing)? Wouldn’t “configured to” necessarily be limited to the disclosed embodiments? If “configured to” meant any machine that does the function, even ones not contemplated by the Applicant at time of filing, wouldn’t that run into the same problem Morse had? Geesh, the new guy Random Nonsense needs to understand the background to this topic a lot more. That’s what Lemley proposed in one of his papers re functional claims in software oriented claims. The problem is that that only works in a post-facto way – there is a different rule for whether the function being claimed is “old and well known”, and from the PTO’s perspective, it’s dangerous to apply the limiting factor and admit that the element is not old and well known. Random Guy, in the PTO, the matter is simple — kind of. Just give the claim term full scope for prior art purposes. If the PTO cannot find structure with that function in the prior art, the claim has novelty. It becomes indefinite if and only if the one element is the sole reason for novelty. Then it becomes equivalent to a single means claim — with nominal elements added. You might want to read and compare Halliburton, Continental Can, and the Gibbs case, and compare to Application of Tarczy-Hornoch, 397 F.2d 856 (C.C.P.A. 1968) where Rich identified the real problem occurred only when one was effectively claiming a result. In the context of a combination claim, this means that one is effectively claiming a single means – where the novelty is solely in the one element and not in a combination of elements. That’s not the important part. The question is what do you give it for 112, 1st purposes. When the claim elements are to old well known structures, broad claiming is preferred and should be given full scope, e.g., when the invention is not in the form of attachment, any means of attaching should be broadly covered, not simply the means disclosed. In contrast, when the structure being claimed is new and forms part of the invention, the claims should be construed to cover the corresponding structure and equivalents. Westinghouse v. Boyden Power Brake Co., 170 U.S. 537, 558, 18 S.Ct. 707, 42 L.Ed. 1136 (1898). — the case cited by Fuettterer, note 11, as the rule of construction. Application of Fuetterer, 319 F.2d 259 (C.C.P.A. 1963). But the claims are indefinite only when the functional language is at the exact point of novelty as twice held by the Supreme Court. “Precise” was the term the Court used. How do we edit our comments after posting? If the applicant claims novelty in a functionally claimed element in a combination and not on a combination of new elements, enter a 112(b) rejection, citing Halliburton. The applicant never claims novelty in any particular element. The applicant only states that the cited references do not teach the element (or by extension, do not render the claim as a whole obvious). Believe me, nothing would be more effective in reducing the backlog than the office having the ability to put the applicant on record as to which elements are novel and which are not. I should point out though that KSR has largely eviscerated the exception in the rule – if the novelty appears through a combination than any known motivation to combine would defeat the invention. That is because Point of Novelty is a canard. Random, I think the PTO would have a right to enter a 112(b) rejection if the sole novelty argued was in a single functional claim element. The applicant could overcome this by writing it in MPF form, or by demonstrating that a new combination was being claimed. PON – a red herring looking for a net. I observe Ned that you are floundering quite badly. I suggest that you give up the canard of Point of Novelty. Yeah, but that is not Rader’s point. Rader’s point is that NON functional claim terms (that is, structural recitations) should not be interpreted in a manner limited to the function they serve in the spec. Your claim for a device for driving nails, specified structurally, should still read on a device for breaking rocks. If he was, Dennis is right. But, how do you know that Dennis is not right? Ned: Rader’s claim construction maxim was part of a primer intended to guide the trial court generally, with no apparent connection to the support frame issue. It seems that it cannot pertain to the support frame because the support frame is the “functional claim term” at issue, and Rader addresses “non-functional” claim terms in the passage we are discussing. Rader has cause a bit of confusion by addressing a peripheral issue. Would you find putting up a pic to be…. That might explain then how absolutely none of your posts are actually useful. Now working on importing comments from these recent posts. pretty pimpin layout man, I like to not have to deal with disqus though it had some decent features. I’m curious how to put up a pic though. I thought Disqus was excellent. I do no like how the comments here are not nested and indented so that one might follow a conversation better. Hmm, under the miyazaki standard, since opposite reactions from Ned and Roufousse are present, the new software must be rejected. Dennis, congratulationss for the clean and sober layout. Great insight about “configured to”. An asymptote is nowhere in sight. I always said that if the softiewafties were right about their term then every patent should have some “configured to” language therein. Otherwise, their term should be construed in a manner other than how they wish and their whole shebang sinks. Looks like I was pretty much spot on. Now everyone wants in on the gold rush of the weasel wordery. One might observe that most computer software claims have more than one new functional element. This effectively defines a method, not a result. One might try to confuse and conflate as well, Ned. Tell me, do you understand the logic in the Nazomi case yet? You did that disappearing from the conversation thing again…. I detest this new system. Essentially, we are back to the old system where name spoofing is possible and it is exceedingly easy to post under dozens of different names. Additionally, the layout is extremely space-inefficient. With even short comments, you can only see maybe three or four comments on a single page. An example of a blog with a nice comment section is http://www.sbnation.com (a collection of sports related blogs). You have to sign up to post. However, you can easily search other people’s posts as well as your own. Read an article for a first time and go back to the article a day later and all the posts that you haven’t read are clearly indicated. Moreover, there are tools for easily navigating to unread posts. Although I think you need a 3rd party app to do so, you can set it up to ignore certain posters. However, it natively allows you to ignore certain threads of a post by just clicking on a down arrow arrow, and these are just some of the nice features it employs. Frankly Dennis, the technology running this blog is extremely outdated and not particularly useful. Yahoo had more sophisticated stuff for their message boards 10 years ago. If you’re worried about space inneficiency such that only a few posts show up at one time all you have to do is hold the control key and zoom out with your mouse wheel. Wham, more posts on the page in smaller font. While your suggestion allows more posts to be read, it would make the blog even more space inefficient. At 100% zoom, the width of my browser window is approximately 16 inches. By comparison, the width of the text box in which the comments are displayed are about 5 inches. This means the comment section is only using about 31% of the available horizontal real estate. The vertical real estate is being wasted as well. The lines of text could be closer together. Also, using my browser, there is about 1 5/8″ between the last line of a comment and the first line of another comment. Oh of course, in terms of efficiency it isn’t a good layout. In terms of making the blog look slick, and be inter-operable on many platforms it is wonderful. I’ve been a website dev in a past life and I recall the whole reason for leaving space on either side. But D may want to throw you a bone and widen it up a hair or two. Or maybe just stop being so lame with the chum lines. Nah they’re all locked up tight in functional language. /facepalm on your lack of logic and (yet more) character suicide, 6. In essence you are saying that you cannot invent around because too many others are inventing around… (or did you forget the ‘explosive’ number of granted patents chum article already? A quick Google search didn’t yield any instances of a blogger being sued for using the technology. Moreover, I would like the damages analysis even if they did. Regardless, there has to be a better host for this website. Anyway, I went searching. Ended up checking out a good many of the ABA Journal Blawg 100 — what a bunch of lousy blogs. Who knew that patent law would be so interesting. I probably looked at 20 of them and I didn’t find one that even came close to generating the amount of comments that are found on this. Also, they all pretty much sucked when it comes to blog technology — so sad.